Don’t be alarmed if this tiny burger joint is packed when you arrive – simply give the friendly, efficient staff your number to key into their iPads and wait for them to text you when a space is free (you can follow your queue status online too). That will give you time to pop off for an aperitif in one of Brixton Village/Market Row’s numerous other buzzing businesses, or to grab a carryout from the off-licence, listen to street music (there’s always something going on in Brixton Village) and generally soak up the atmosphere in these covered streets. Once you’re in, there’s no time to waste mulling over the menu. There are five simple choices – plain, cheese, ‘honest’ (with bacon and cheese), a special (manchego and chorizo, perhaps), and a vegetable fritter. 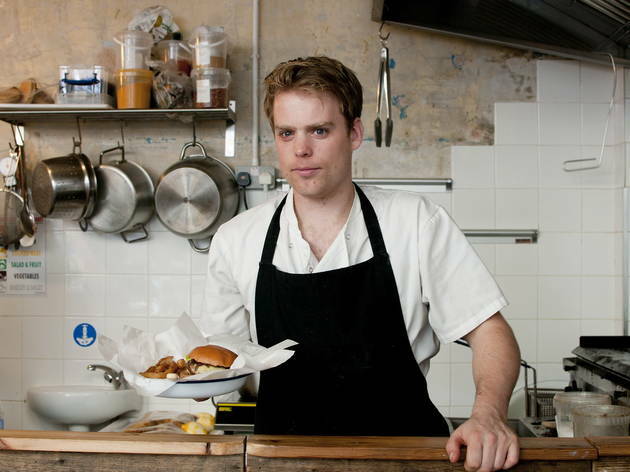 Beef is supplied by Ginger Pig, cooked medium, served in a glazed bun and is just as juicy as you could wish. Honest’s signature chips are seasoned with rosemary salt. There’s a minimal wine list, ale from Redchurch brewery in Bethnal Green, and local speciality Ossie’s ginger beer. Fast food at the top of its game. Best bloody burgers I can find in London! This was my first Honest Burgers experience, and I've tried a few round the city, but Brixton seems to come out on top every time. Will return for sure. Don't care how long I have to wait, these burgers are worth t every time. 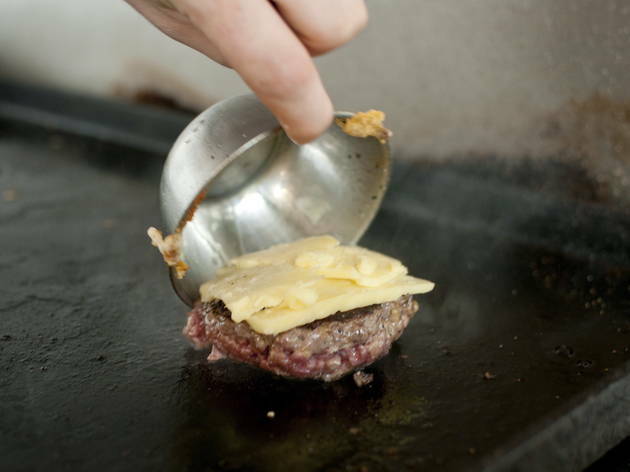 I struggle to eat most burgers as I find them too tough and tasteless, but honest burgers are cooked to perfection and melt in your mouth. The chips are Devine. I wouldn't eat a burger anywhere else as they just don't compare to Honest. And I met the girl who is now one of my best friends there, so I will happily give it 5 stars! Honest burger's vegan burger is honestly the best thing I've ever had! I crave it all the time. For January, they are doing a special vegan burger which was also really nice, although I prefer the classic. 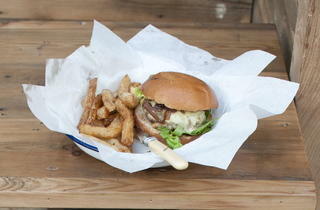 Okay, so everyone knows that Honest Burger serve up the best burger in town. Let's not beat around the bush; the juicy, pink pattie with sweet caramelised onions, tangy pickle and gooey cheese all combine to create a mouthwatering experience. The rosemary chips are unbelievable- salty, golden, crispy and they do not shy away from the rosemary for all the right reasons. And the best part is that these come with the burger- no need to add as a side. I love the Brixton branch, as it is right in the heart of Brixton Village, so you can sit outside, watch the world go by and soak up the buzzing, vibrant atmosphere. The staff here are also super friendly and efficient, especially as they often have a queue snaking round the corner. Take advantage of the great partnership they have the Brixton Ritzy, where you can get a burger and cinema ticket for a bargain-ous £16; that's your next date night sorted. My only gripe is I wish they served wine in proper glasses, rather than the trendy fad of serving in those little water tumblers which get warm so quickly. However, with a burger this blooming tasty, I can forgive them this little quirk. I've heard all the hype about Honest Burgers but the queue always puts me off. I was lucky enough to go about 2100 and didnt have to queue. Compared to GBK and other burger establishments, this one's price includes the chips which are seasoned with rosemary salt. Tick! The burger itself was juicy and a little uncooked but I like it like that. Sadly I dont know what the hype is all about. Its good dont get me wrong but I dont think its worthy of all the hype! I rank it higher than a 5 guys burger but only based on cost and marginally beating it in a taste test. Finally they charge £1 more for a gluten free burger which is a bit painful especially when the burger bun is way smaller than a normal one. I feel penalised for having an actual allergy. Its not a fashion / fad for some! Although 'burgers' is in the name, I'd say it's all about those rosemary fries. WOW. Burgers are good, but not as juicy as they should be and the brioche buns can be a little oily... but all in all I would recommend for a quick bite to eat (although you likely will have to wait a little while for a table on a weekend) for a decent price. Honest burger is honestly one of the best burgers in town, cooked to perfection you can have an honest burger or a tribute burger, which literally melt in the mouth. All the burgers come with rosemary fries, I have never tried these before, so was a little sceptical, but they were delish. Price for an honest burger and chips is £10.50 and worth every penny. 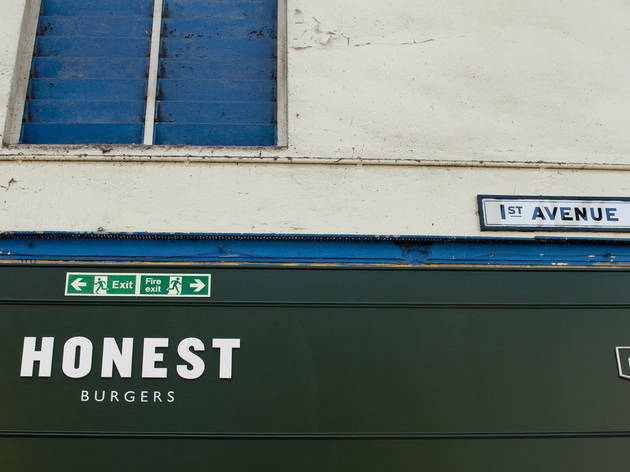 Now I always love to get my honest burger fix, they have plenty of chains around London, so go check it out. I do like an honest burger but I really feel that the whole having a really simple menu and only a few options only works when a place has become popular and is drawing people in but to retain loyal customers and keep people excited about coming back, more options and more than one type of fry (although I do love their rosemary fries! )should be on the menu....especially for veggies who only have one choice of burger. Also, who's ever heard of a burger restaurant sans milkshakes? I must start by saying that my expectations for Honest Burgers were extremely high - not only are the reviews on this page positively glowing, but I've been recommended to go here by pretty much everyone I know. This is a lovely spot for a quick bite - nestled right in the middle of the hustle and bustle of the market, and our burgers were flavoursome and filling. We were short on time and feeling ravenous, and Honest hit the spot. That said, I have to own up and say that I was rather disappointed. These burgers just didn't live up to the hype for me, and I won't be rushing back. What a wonderful little place. 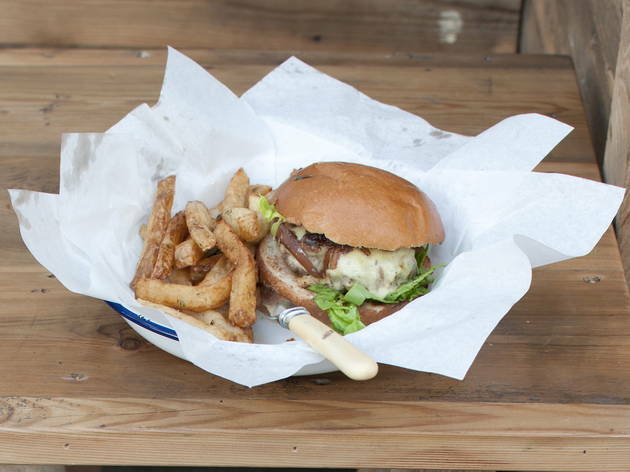 Hidden away in Brixton market, this burger shack offers gourmet burgers at reasonable prices. Featuring produce from the market, Honest Burgers always seem to come up with new and exciting specials. Keep an eye out for the rib meat with their own recipe hot sauce! This is the best chicken burger i've ever tasted. The portions are generous too. The chips are so more'ish with the rosemary seasoning. I've been to the other burger chains and this is no doubt the best one. You wont be disappointed. Always a secure choice. Great burgers, nice atmosphere and good service. My fav is the one in Soho, on Meard Street, I have eaten there hundreds of times and when a friend of mine comes back from Doha for work we always try to get a table at lunch (challenging). More recently I have been to both the one in Brixton - achingly trendy - and the one on Pentonville Road near KX (my least favourite so far). Back in the old days I maintained that theirs was the best burger in town. Now however, and I am sad to say so, my 5 star rating has dropped to 3.5 (I put it in as 4 for nostalgic reasons). The cause for this fall from grace, in my addled mind, is because they are suffering from getting too big too quickly - the deadly absentee messiah effect that must happen when the founders are spread too thin. Their keen eye for detail and their passion for getting every burger out as good as the last one seems to have gone awry recently. They are still up in the top five but not on the podium, time to pull your socks up guys you deserve better. Have been here a few times. 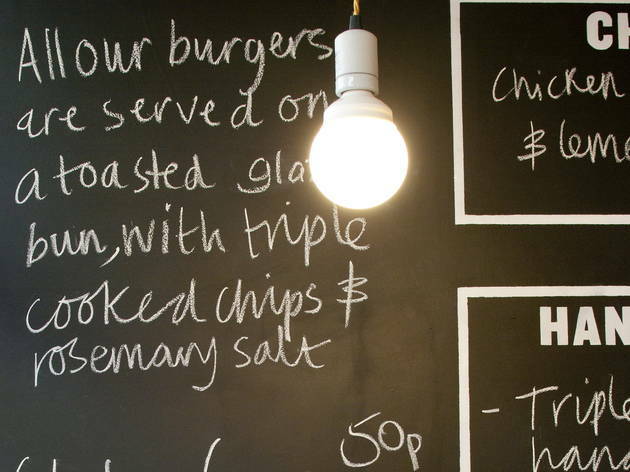 Truly honest burger and chips come at no extra charge! P. S.: I love sipping their homemade lemonade with my meal, a pure must! ROSEMARY CHIPS, ROSEMARY CHIPS, ROSEMARY CHIPS, ROSEMARY CHIPS, ROSEMARY CHIPS, ROSEMARY CHIPS, ROSEMARY CHIPS, ROSEMARY CHIPS, ROSEMARY CHIPS, ROSEMARY CHIPS. Not much more needs to be said really. Believe everything you've ever heard about these chips. They make all other chips seem like pathetic KFC cardboard imitations. Oh, and the burgers are not bad either. But visit for the chips. You won't be disappointed! I would say it's the best place to have a good burger in London. But it's not just the burger, the chips are also really good. Nobody likes a no-booking restaurant when you're hungry but HB have got the system down, leave your number with the host and spend 30 minutes enjoying a pint in soho while they find you a table, so much less fussy than standing around outside getting seen/angry! Great burgers, fantastic onion rings and rosemary chips with so much flavour they hurt your tongue a bit (in the good way). All burgers come with chips. 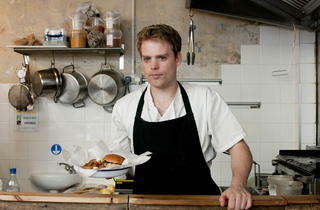 Best Burgers in London by far, and I have tried my fair share. It's also my favourite of the Honest Burger venues. It's true that it can get quite busy, but the staff are friendly and the quality is consistently excellent. The manager of this eatery is a fool. She turned away me and my partner! claiming that she was waiting for other customers, and they would be closing in 30 mins. However when we walked pass 30 mins later, the place was still open, and more or less empty, meaning those expected customers did not show. When we complained about this, she became very defensive, and then resorted to say that we were accusing her of racism!!! Utterly ludicrous and ridiculous. I intend to take this matter further, as how on earth does anyone turn away customers in this day and age. The fad of American burgers and food invading London has done nothing to put a chink in the armour of London's finest burger joint. Toe to toe, in my humble opinion, Honest Burger wins hands down in every aspect of the burger department, from the aged steak meat patty to the rosemary infused chips. Here, you can actually tell that the chips were from an actual potato rather than the crinkle cut reformed monstrosities we get across the the Atlantic (now a shack about 15 minutes walk away if you know what I mean) Here's what I say to Honest Burgers. Shut Up and Take My Money!!!! I live literally 1 minute from this place and it has become my second home. The burgers are spot on every time, chips are salty (just how I like them). DELISH. Admittedly I'm not the biggest burger fan but I found the burgers pricey, and whilst the meat inside the buns was undoubtedly very nice, the chips were far too salty for my taste. Also the air inside the place was just too greasy foe me, the beer was ok. All in all, ok, perhaps even good, if you like that sort of grub and don't mind a load of salt and your clothes smelling of fat, a certain, I'd imagine American burger experience but personally I wouldn't go there again. 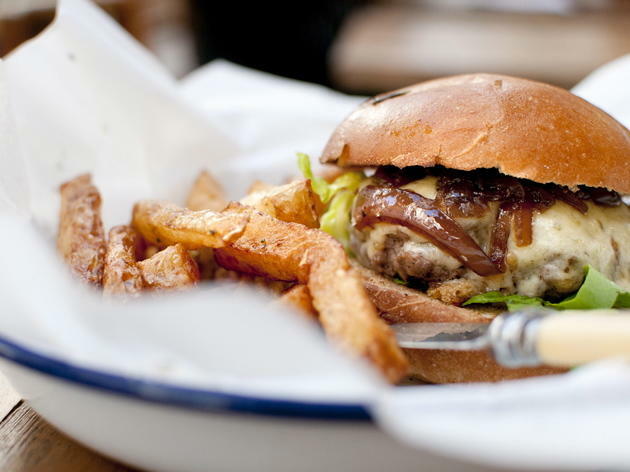 The best burgers of London! Now, I've said it. Oh and I love the rosemary fries too! YUM. Just got back from my second trip in a week. One word - AMAZING. Best burger I have ever had. I'm going back on Sunday! Perfectly sized and seriously tasty burgers, divine chips and friendly service. New fav burger spot–will be back! The brioche burger has become a lot more mainstream in the last couple of years and to be 'honest' (har har), these burgers are very ordinary for the price you pay. It's around £8 for a burger and chips and plus drink is a tenner, which is damned pricey, for a burger which is very greasy, quite small (the advertising video for this place is misleading, u only get one small patty) and my triple-cooked fries which were dareisay.... burnt? Bar Boulud serves up a truly amazing burger and it's only a little bit more.They've obviously spent a lot of time and effort on marketing, at the expense of value for money. There's another place in Brixton Market Row called Bukowksi's, which tastes as good but is a bargain £5.50 for a bbq pit burger n fries, that is without doubt more tastier and not as pretentious. My 'honest' recommendation? Go there and feel more satisfied. Sorry lads, i know my burgers! Simply put the best burger I have ever eaten. A couple of others come close, but you can forget about most of them. 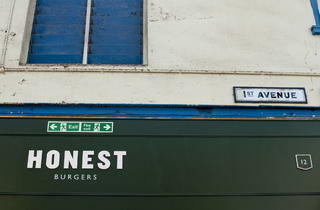 Honest Burgers is very simply THE best burger, time after time after time. Final went this weekend. Worth the wait. Chips weren't too salty but the burger was insane. SO SO GOOD. This place is a little gem in Brixton market. Get there now before Brixton market gets taken over by the chains that will push in as rents rise. Lovely service (they rushed it along as we were trying to catch a movie) and really superb burgers. A daily special is chalked up and I opted for this chimchuri and chorizo number. Proper messy meat-juice-down-your-arm number served with their crispy fluffy triple cooked skinny chips that should probably come with some kind of health warning. You didn't come here because you were on a diet though... Reckon you might be waiting a while to get a table in peak hours, but with food this good its only a matter of time before they expand out of the market and into a bigger site. Get there now though as the atmosphere is all part of its charm. Enjoy. Best burger I've had so far in London and I've been to Meateasy and Byron and Ground which I think is now gone. Chips were quality as well. Price for it all was exceptional. Enjoy this place while it's still cheap and in Brixton. The only reason I hesitate on 5 stars was the fact that the time it took to receive our food from placing the order was exceptionally long . The timing in the kitchen needs to be sorted out. Apart from that can't really complain, service was very friendly just loong! 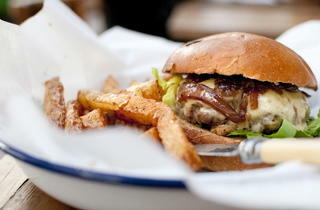 Best burgers in London... #meateasy eat your heart out! Absolutely delicious, one of the best burgers I have ever had. The rosemary salted chips are a great compliment to the meal. They are always busy but it's worth waiting. Friendly service too, highly recommend a visit. Having read the time out review I was unsure what to expect! Well I can tell you it was fab! Great meaty meat and the rosemary salted chips are to die for I waited 20 minutes for a table but it was worth the wait How cool is Brixton village!! 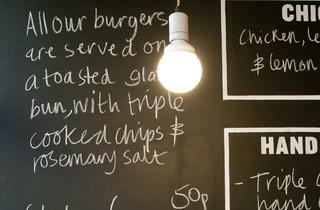 Delicious burger, great chips and 'honest', friendly service. Love the gluten free bun too! Surprised at the review above. I found the chips there to be really fantastic. Crunchy exterior, light and fluffy on the inside with a subtle rosemary(?) salt bite to complement the beef patty. I've been back twice now and on both occasions have found myself ordering a second portion. 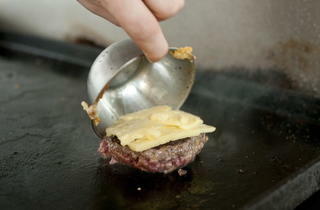 Really original burgers too, no fuss, quality ingredients and deliciously juicy.